Mayor Carl T. Langford (1918-2011) and Chief of Police Robert Joseph Chewning (b. 1923) with the Orlando Police Department (OPD). 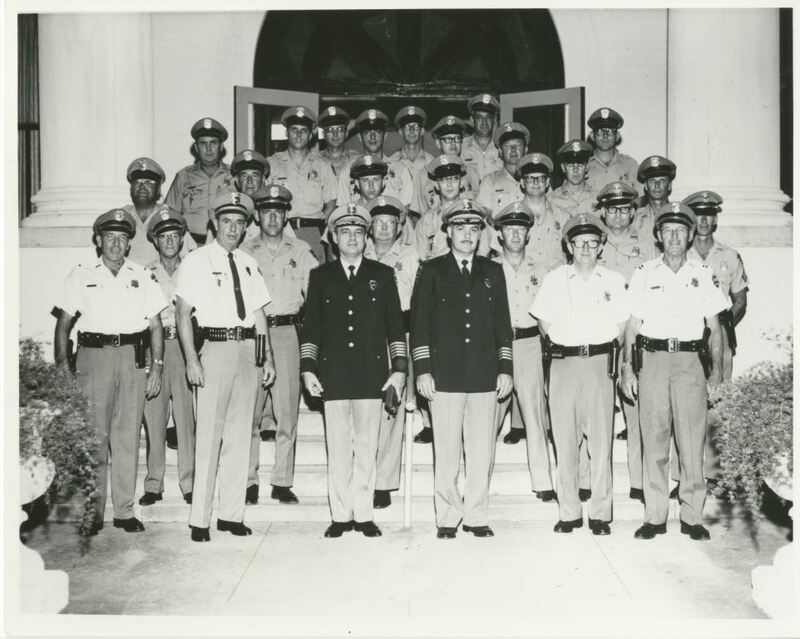 Mayor Langford is pictured third from the left in the first row and Chief Bob Chewning is the fourth from the left. Mayor Langford was elected as Orlando's 29th mayor in 1967 when his predecessor, Mayor Bob Carr (1899-1967), died in office. Mayor Langford served for over a decade as Orlando's mayor from 1967 to 1980. He helped foster Orlando's growth from a boom town in the middle of the 20th century. 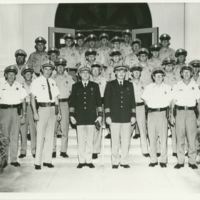 As one of his first acts as mayor, Mayor Langford appointed Chewning as OPD Chief of Police in 1967. Chief Chewning has previously served on the mayor’s inaugural staff and he retired as the city’s Director of Public Safety in 1976. Original black and white photograph: Orlando Remembered Exhibit, Orlando City Hall, Orlando, Florida. Clark, James C. Orlando, Florida: A Brief History. The History Press, 2013. "A Tribute To Robert Joseph Chewning." Orlando Police Retirees. Accessed February 3, 2016. http://orlandopoliceretirees.com/Robert%2520Chewning%2520Tribute.pdf. Weiner, Jeff. "Carl Langford: Former Orlando Mayor Led City during Period of Tremendous Growth." The Orlando Sentinel. July 9, 2011. Accessed February 4, 2016. http://articles.orlandosentinel.com/2011-07-09/news/os-obit-carl-langford-20110709_1_mayor-buddy-dyer-carl-langford-longest-serving-mayor. “Mayor Carl T. Langford with Orlando Chief of Police Bob Chewning.” RICHES of Central Florida accessed April 23, 2019, https://richesmi.cah.ucf.edu/omeka/items/show/7883.